Vista House dedication ceremony, May 5, 1918. Did you know Henry Pittock played a large role in the construction of the Vista House? The Vista House is located at Crown Point along the Historic Columbia River Highway. The Columbia River Highway, constructed 1913-1922, connected Troutdale to The Dalles and the scenic hiking trails and waterfalls along the Columbia River. An engineering marvel at its time, the highway made passage of this difficult terrain safer. The Vista House was proposed as a viewpoint rest stop for Columbia River Highway travelers and a monument to Oregon pioneers. The Vista House Association, made up of local businessmen, was formed to raise money for its construction. Henry Pittock, an Oregon pioneer himself, was named president. 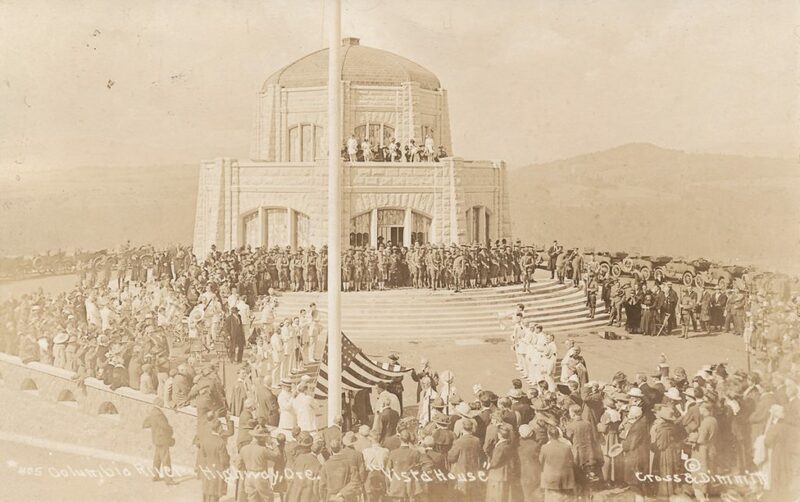 The Vista House was completed and opened with a dedication ceremony on May 5, 1918 despite missed fundraising goals and multiple increases in construction costs. Henry Pittock was among the dignitaries at the ceremony. Today the Vista House, like Pittock Mansion, is a favorite destination for tourists and locals alike!